Why do we call them “walking simulators?” I don’t remember critics of first-person shooters giving them such a sarcastic name. The skeptics aren’t wrong—they’re just misinformed. There’s more to this genre than putting one foot in front of another. If you open yourself up to exploring a world rather than blowing it up, and absorb the details of a world sans shooting and killing, you’ll be surprised by the eloquence of a story independent from the truncated audio logs and journal entries flooding modern action games. A good story is a subjective thing. After several personal traumas this year, I connected with Edith Finch because it echoed the pain of my own family’s trials. Family, specifically the pain of the people that comprise it, is the root of the game. Edith Finch visits her childhood home to confront her family’s tragic history. As you explore the circus-like funhouse, long-abandoned among the eerie quiet of the Pacific Northwestern woods, you learn about Edith’s familial curse: to die young, and tragically so. One of the first rooms Edith enters is the long-abandoned kitchen, a space at the center of so many family gatherings. Garbage, dirty dishes, old newspaper clippings, and knick knacks are spread across the dusty kitchen counters and dirty floor. In the beginning, the exploration is predictable. It’s a lot of looking around an old house, piecing together some spooky family curse. It’s easy to brush the game off as another Gone Home. However, we quickly learn that as Edith moves upward, her story shifts from passive exploration to interactive absurdity. The higher you go, the more fantastical her family stories become. In an apt choice of level design, the house’s architecture informs the gameplay, with the most-affecting stories saved for the highest levels: on the roof, there’s an entire labyrinth of sheds, cubes, and bedrooms connected in a physically impossible way. Up there, we experience the saddest of the Finch deaths. The Finch house is made greater by the sum of its parts. Every family member’s bedroom, from the grandmother to a doomsday-prepping uncle, is immaculately designed—a perfectly constructed diorama. Interactive objects snap Edith into the owner’s past life to experience how they die. Flashbacks aren’t new to games, but making us live through these histories adds an emotional weight to Edith’s exploration of the house. Their deaths become more sad and realistic because we’ve spent time poking around their personal effects. 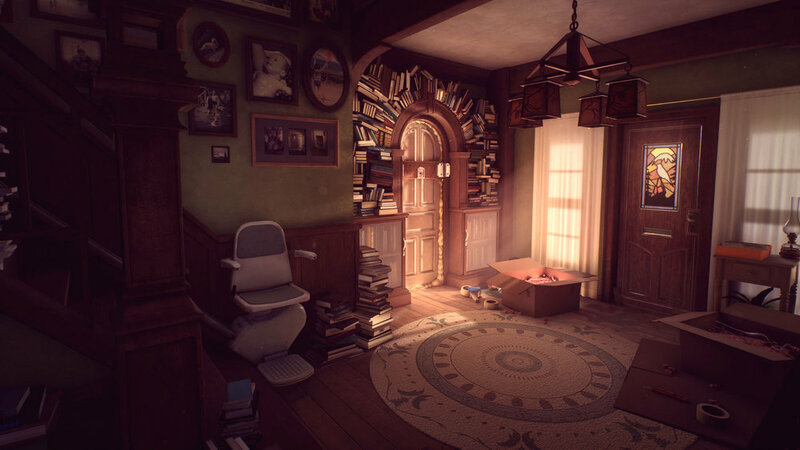 The empty, eclectic house where Edith Finch takes place is an allegory, and it’s never clear if the house is truly built in such a haphazard way or if it’s all Edith’s psychological projection of the outsized shadow the house casts over her and her ancestors’ lives. The house twists and turns in and out of every room, with pastel colors and impossible architecture constantly reminding you that this house is more than just raw materials: it’s a state of mind.